Quite a few posts on this blog have been focused around the excellent New Art Gallery in Walsall, a prestigious building opened in 2000 at a cost of shed-loads, which houses an extraordinarily fine permanent collection based around the amazing Garman-Ryan Collection given to Walsall in the ‘seventies by Kathleen Garman, Jacob Epstein’s widow and a Black Country girl born and bred. The Gallery also houses an important Epstein archive. So, a £100K kick up the bum next year to wake things up, then a year’s grace, then in 2019 the £470K subsidy will be reduced at a stroke to £80K. No matter how they dress this up as an “opportunity” (don’t they always? ), I just can’t see enough “new business” or “philanthropic support” arriving by then to plug a gap of such proportions, even with sensible trimming. Something brave and creative is needed from the Council here, with a commitment not to go for closure while solutions are being found. A note on “environmental implications”, further on in this document, anticipates the Gallery building being “disposed of”. What happens then to the collection? I’ve no idea what legal provisions may have hedged in Kathleen Garman’s gift to the Borough, but if they’re not watertight and more, I can see Sotheby’s rubbing their grubby hands already. I’ve no intention of allowing this issue to hijack the blog as happened with Mandergate a couple of years back, but if a campaign coalesces somewhere beyond the existing petition page, I will post a link. Wolverhampton, excuse me for saying so, seems like a city of lost souls these days, and to mark this, much of Wolverhampton Gallery is under builders’ sheets at the moment. Of what was on show today, I couldn’t manage long in David Ward’s desperately quietist (yawn) exhibition “In a Landscape”, but I did enjoy the room of Big Ceramics, though it served to remind me that the Wolverhampton school where I worked till a couple of years ago celebrated my departure by ripping out our ceramics kilns and the whole clay area in order to create a reception desk. Ceramics being too low a material, too grubby on the fingers, to be “innovative” enough for the Design Technology suits anxious to keep Art within limits they could handle. Wolverhampton has a lost history of voluminous sculpting, as exemplified by Robert J Emerson’s Mercury frieze on the Express & Star building, which hailed me in passing, camera in hand, on my way back to the bus station. This cracking piece of Blakean muscular deco was done in 1934 for the opening of the newspaper’s new premises. Emerson was close to the editor, and had even had a studio on the site. According to one source, a local doctor’s son was the model (blimey, steady on ladies), and the piece is not carved but actually cast in reconstituted “Vinculum” stone. Now there’s an innovative technology for you. The beckoning forefinger risks misinterpretation these days, and I feel that Emerson might have compensated for the foreshortened view from street level by stretching the legs, but otherwise it all works pretty well. He managed to avoid Epstein-type controversy by inserting a teeny fig leaf, and as far as I know, no fundamentalist Christians have yet objected to his inclusion of a pentagram. Though the Express & Star, I have to say, is now well beyond its years of greatness and a poor excuse for a newspaper. While sat in the Gallery café I spent a while making notes towards a review of Mary and Bryan Talbot’s new graphic novel on Louise Michel, The Red Virgin and the Vision of Utopia. The problem terms here, of course, are “vision” and “utopia”. If we wished to disable radicalism one sure means would be to invest it in a utopian vision, and to confine that vision in the cultural game reserve of comic books. Is Emerson’s god of communications a utopian image? For sure, it’s brazenly optimistic, and as historical utopias of both left and right are reduced to a residue of steampunk gameplay, such public optimism looks rather out of kilter in today’s Wolverhampton. Nothing recent here, I know. Apologies. (Energy has been spent elsewhere, on my other blog, which readers of this one are unlikely to find of interest.) 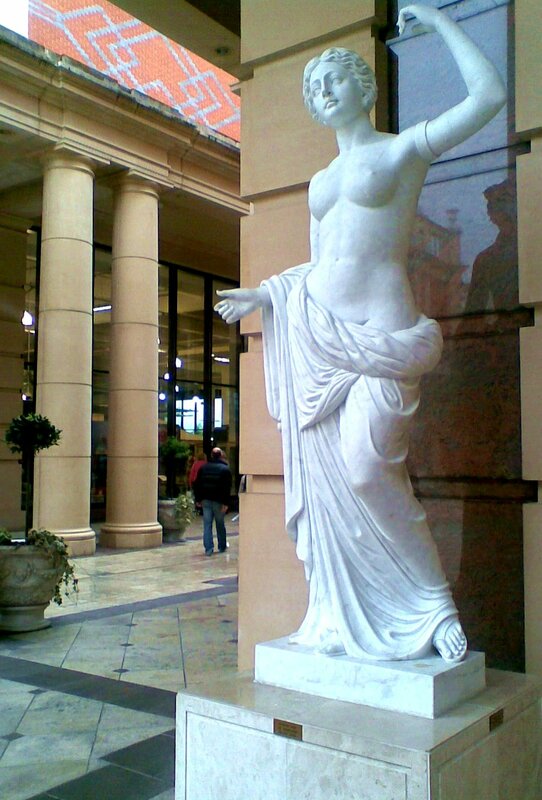 But a recent shopping trip Up North brought an opportunity to gawp at the Trafford Centre, Greater Manchester’s jaw-dropping acid-classical Xanadu of kitsch. Mancunians perhaps have grown blasé about their local outbreak of Delirium Tremendous, but for the rest of us the obvious question is: was there ever a moment in the late ‘nineties, when this shopping centre was built, when an opium reverie blended from bits of De Chirico, Dali, Alma-Tadema, Piranesi and Robin Ironside was actually the expected flavour of the weekend retail experience? Because if there was, I must have missed it. So the next question has to be: what on earth were the Trafford’s architects and designers on? Maybe this has something to say about our troubled perceptions of The Past in the run up to the Year 2000 – the Trafford as fin-de-millénaire panic gone large. It certainly involves a late, disturbingly decadent, and hallucinatory version of neo-classicism, drawn less from Praxiteles than from Canova. Unaccountably meaningless and garbled murals jostle with palm trees, real marble Caesars, golden fountains, distant obelisks and massy Egyptian colonnades – more post-ancient than post-modern, in fact. Then, for good measure, just when you think you may be coming down, streets out of Old Beijing and New Orleans lure you into a vast, starlit, subterranean eatery done out like an ocean liner complete with swimming pool. Only the iceberg is absent. Despite the unrelenting and unsettling oddness of it all, it seems unknowing, as if irony was not the intention and this was someone’s sincere idea of quality for the masses. The occasional statue would be unremarkable in a shopping mall, but here the sheer, overwhelming weight of pastiche and incongruity topples the whole installation off at a tangent in the direction of the astral plane. Can you tell that I’m impressed? I’m not sure that any photo can really contain the Trafford’s Full-on Bonkers Effect, but here’s a gallery of fifty snaps from my (rather pre-modern) phone. Click for the slide show and dip into the trip! The online focus of the growing campaign to save Wolverhampton’s endangered Hepworth sculpture (see previous posts) is now more at our Facebook page and the linked petition – please sign and pass on the word! A quick round-up of the latest news on the Mander scandal appears below in this post. But first, this thing has tentacles, and some of the implications are worth thinking through. So for the first half century, the remarkable permanence of Wolverhampton’s Rock Form (Porthcurno) depended on trust. A paternalistic virtue maybe, but it worked. In the era of RBS, trust is found unprofitable and has been binned. In this public situation the sculpture ceased to be a single image, but became a collection of overlapping impressions produced by the movement around it of multiple viewers. (“Look at the colours, textures and shapes,” wrote the Mander Centre’s architect Stanley Sellers in the Express & Star in 1968. “See how these change as you walk around it. See the effects of changing light and shade.”) Hepworth was so positive about this collective, interactive setting for her work that she provided the Wolverhampton cast of Rock Form at cost price, just one third of what it would have fetched at the time if sold through the gallery system to a private collector. Herbert Read wrote much about Hepworth’s “vitalist form”; what we haven’t always appreciated is that in her public sculpture this vitalism was collectively generated. Once this context is understood, it becomes literally unthinkable that Rock Form should be ripped out and condemned to private ownership. Isolated within the private contemplation of a single privileged spectator, the work will no longer make sense. It will be dead. Mandergate is, sadly, far from the only instance of the “de-accessioning” of public access to public sculpture. A previous post has already mentioned the Hepworth, narrowly rescued from Bonham’s auctions, that Royal Mail graciously replaced in front of the Chesterfield post office where it had always been at a cost of half a million to the community and the Art Fund. 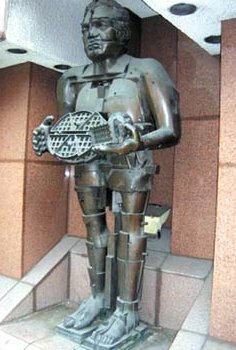 In late 2012 Bonham’s flogged off Eduardo Paolozzi’s The Artist as Hephaestus, which its owners had plucked from its niche on an office block in High Holborn, in the face of protests by the council, the 20th Century Society and others, and in spite of the inconvenient circumstance that it had stood in a conservation area. Public museums are as vulnerable as public spaces. Northampton Museum and Art Gallery has just been stripped of its official accreditation after its prize Egyptian statue went to a private buyer last month at Christie’s. This makes the museum ineligible for grant funding, but they’re don’t care; they’re still quids in, given that the statue fetched an eye watering £15.8 million. There are other cases. As all the dosh drains upwards to the tip of the pyramid in our “recovering” economy, the art goes with it. This plundering is reminiscent of the wholesale looting of artefacts from subject cultures in the colonial era. Just as aboriginal peoples have demanded from Western museums the return of their significant treasures, so it will be necessary for future generations to retrieve and repatriate the artworks taken by big money from our shared spaces. The campaign has recently gained important support from the Royal British Society of Sculptors, Wolverhampton Partners in Progress and the Black Country Urban Industrial Mission. 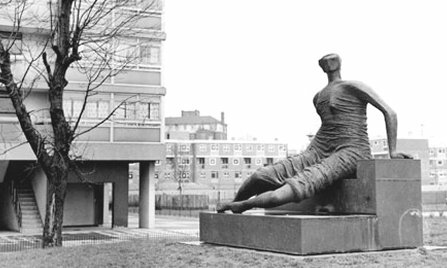 Anne Rawcliffe-King, Director of the Society, has stated: “I am deeply saddened that yet another public artwork may be lost for the nation.” The Society has written a number of letters to parties concerned. Meanwhile City Council Leader Roger Lawrence has put out a press release calling on George Osborne, as the person to whom RBS is ultimately 80% accountable, to intervene. August 8’s Private Eye carried an excellent write up of the Mander affair, the first report in a national title, but hopefully not the last – read their article on our Facebook page. A petition to Delancey and RBS to put back the Hepworth has just been set up using the 38 Degrees campaigns page (purely for its convenience and not for any political reason), and has attracted a steady run of signatures. … and now you don’t! But the ghostly white rectangle left by the plinth has resisted all attempts by Mander staff – I kid you not – to scrub it off. So it was with great interest, if not great expectations, that I popped in last Friday to see Nick Pitt, Mander Centre Director. Nice office, wonderful view over the city, nice coffee, nice conversation. A very nice man, actually. But not giving much away, simply advising objectors to contact asset managers Delancey’s, further “up the food chain”. Though Nick did insist that no decision about a sale has yet been made. But in that case, why whip out the Hepworth long before the redevelopment had even been given planning approval? And why clam up? Nothing may yet have been minuted, but you can hardly blame us for suspecting a definite intention to sell. 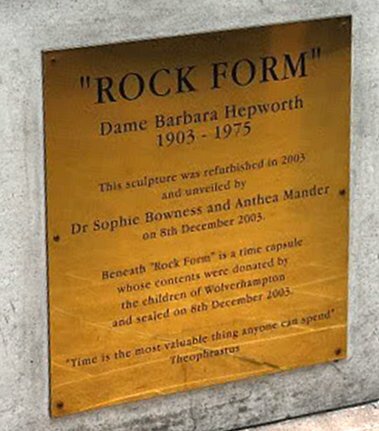 Rock Form was bought from Barbara Hepworth for the Mander in 1968 by its architect Stanley Sellers, who died last year (and so is no longer in a position to object to its removal), at the reduced price of £4000. Someone who ought to know tells me that at auction it could fetch well over the million pound figure recently bandied about. Even allowing for the seller’s commission, that’s not a bad profit. 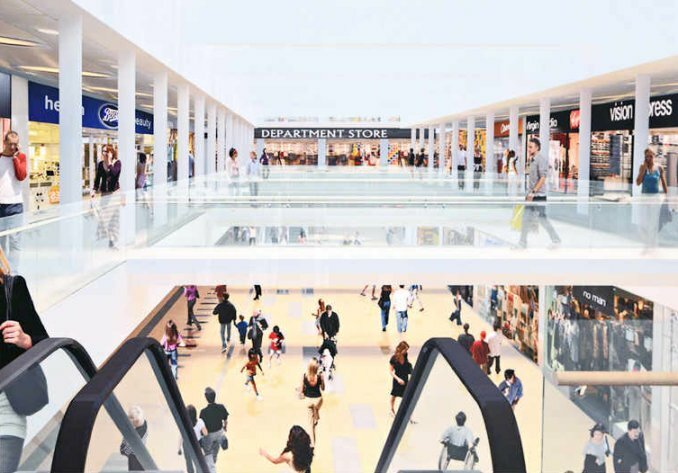 Judging by the artist’s impressions, the redeveloped Mander Centre will look a bit big on bland and a bit short on inspirational. Surely those whitened acres of horizontal perspective could use a focal point, a familiar marker with a bit of verticality, something iconic, something symbolic of Wolverhampton reborn and reinvigorated, the Centre past and the Centre future? Seriously, what could be better than Rock Form, whose curves and voids are both heritage-ancient and space-age-futuristic, with a popular “retro” flavour that brings the ‘sixties into the 21st century? Stanley Sellers chose well when he picked it from Hepworth’s St Ives garden. It’s just right for the Mander, and the Mander will look sadly bereft without it. How many other shopping malls do you know with something of this quality – something to be proud of? 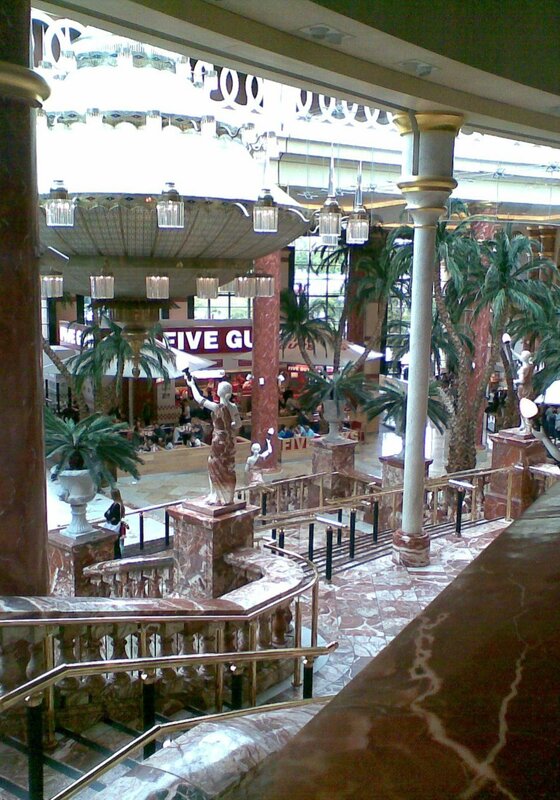 I mean, have you seen the kitsch in the Trafford Centre? Plan B: if there’s no place for the Hepworth in the Mander, shouldn’t it move to Wolverhampton Art Gallery? With recent panic talk of bins unemptied and libraries down to 15 hours a week, the idea of coughing up a million is unlikely to go down too well with the council, even with an Art Fund sub. But the Hepworth was bought at a mate’s rate in 1968, and if they can’t house it, the least its custodians can decently do is to find it a new home locally on a similar basis. Counting inflation at RPI rates the £4000 paid in 1968 would be a tad over sixty grand in today’s money. That seems about the right price to me. And the massive kudos that this act of generosity would bring to the beleaguered Evil Empire at RBS would surely be a bargain in the circumstances? After all, RBS managed to find not one million but £576 million for bonuses in 2013. 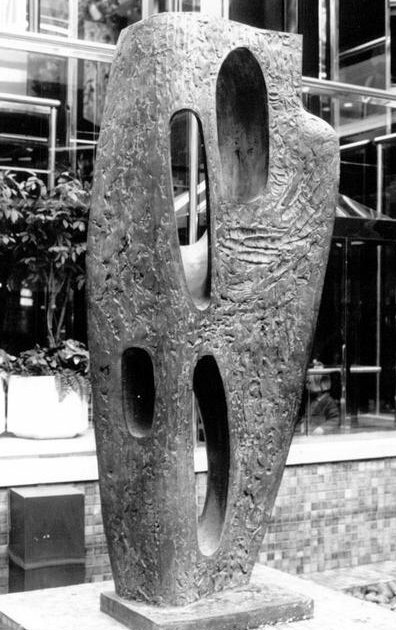 Wolverhampton’s Barbara Hepworth – how safe is “safe keeping”? 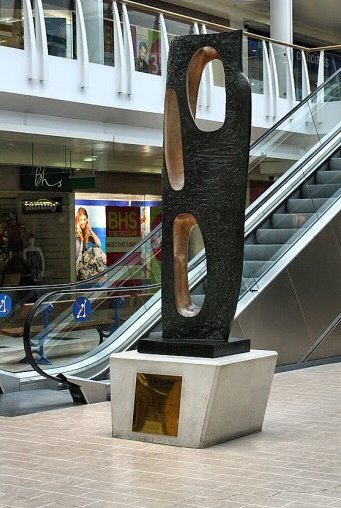 A mooch across Wolverhampton’s depressing and disintegrating city centre usually takes me through the Mander Centre shopping mall, where at least there’s a stately Barbara Hepworth bronze to cheer me up. Rock Form (Porthcurno), one of six castings made in 1964, has stood in the Centre since its opening. At first it sat on a low plinth, but was later made the focal point of a rather tacky water feature thing, hemmed in by tinkling fountains. When that was wisely removed the sculpture was given a clean and re-unveiled on a new plinth in 2003 by the late Anthea Mander and Dr Sophie Bowness, Hepworth scholar, trustee of the Hepworth Estate and the artist’s granddaughter. Inside the plinth was sealed a time capsule, containing items donated by Wolverhampton children. 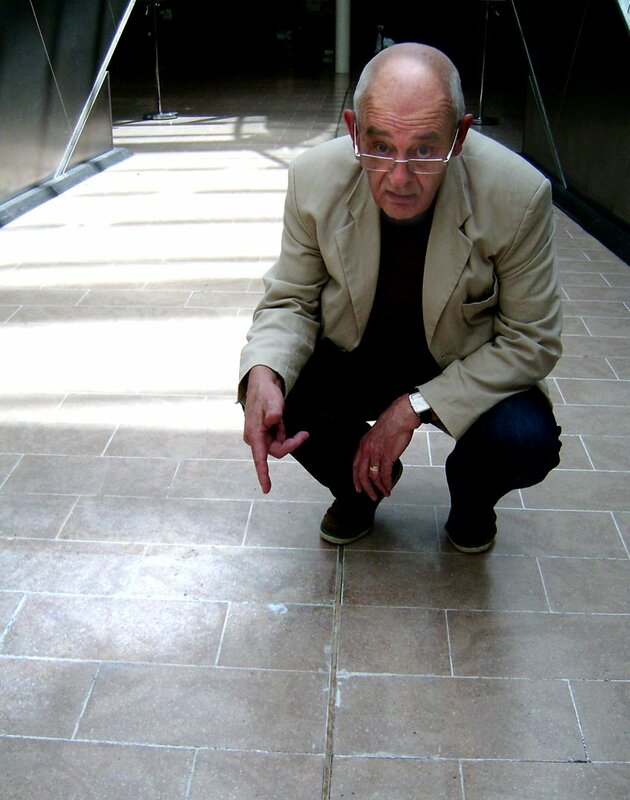 On one spot or another Rock Form has been at home in the Mander Centre for 46 years and in 2003 the intention was clearly that it should stay there for a lot longer. But not any more, perhaps. My most recent stroll revealed a ghostly rectangle on the floor below the escalators where the plinth had been. So what’s going on? 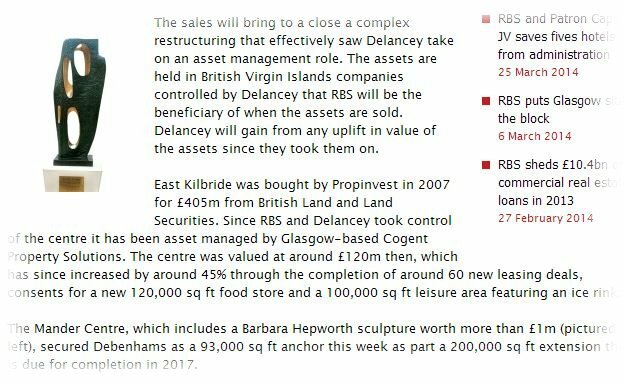 In 2010 the Mander Centre formed part of a portfolio of “distressed assets” bought by property firm Delancey, backed by a partnership loan from RBS, the British public’s favourite bankers. In late February this year the Centre management announced an ambitious revamp and extension to be completed in 2017, with a new Debenham’s signed up as an “anchor” attraction. In mid-May, surprisingly, Delancey announced that it would be offloading the Blade portfolio, the Mander Centre included. The revamp, apparently, will not be affected. Agents for the Centre’s sale are Cushman & Wakefield and the asking price is reported to be £50 million. In late March an application was made for planning permission for the first phase of the redevelopment, but no start date has yet been announced. In which case, why has the Hepworth been removed? “For safe keeping prior to development,” according to a Mander Centre spokesperson. This seems a tad premature, given that (a) there is no start in sight, (b) the projected first phase, the demolition of the Bell Street corner, is nowhere near the sculpture and (c) Centre management has promised that the site will stay open throughout the development. Perhaps significantly, the groovy artist’s impressions of the revamp show no sign of the Hepworth. Am I worrying too much? 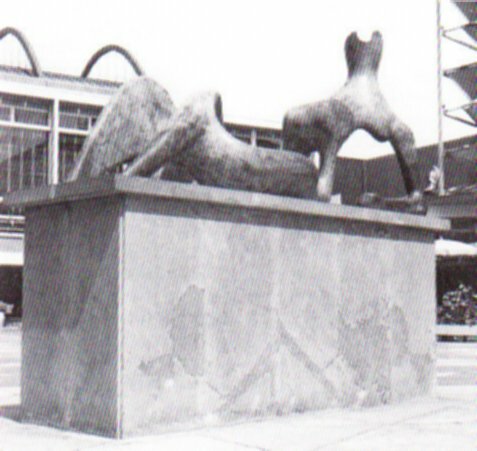 In 2004 Royal Mail removed a Hepworth that had stood for 40 years outside Chesterfield post office, for temporary exhibition elsewhere. Mysteriously, it failed to come back, but was later spotted at Bonham’s, sporting an estimate of £600,000. A public outcry eventually forced its return in 2009, at a cost of £500,000 (largely from the Art Fund), though Royal Mail had been pushing for a million. I assume that the Wolverhampton Hepworth is now owned by Delancey and that they can do what they like with it. But let’s put this into some context. Wolverhampton is not unblessed with sculpture of sorts in public places (not least roundabouts), but Rock Form is by far and away the finest and most important. 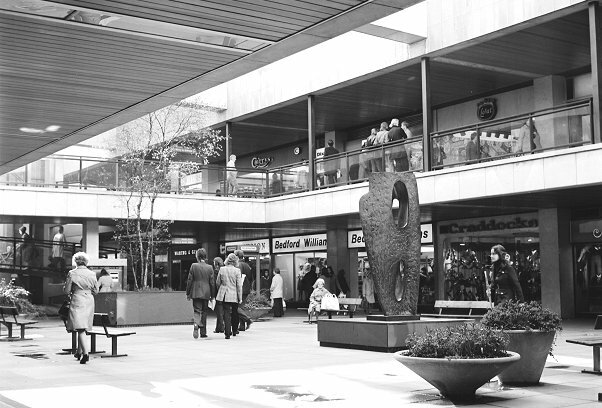 Its selection for the Mander Centre in 1968 was a matter of some controversy at the time, the opposing lobby favouring something trad and figurative, but the Centre’s architect Stanley Sellers, who died last year, was a St Ives insider and a close friend of Hepworth, so Rock Form it was – a bold but entirely appropriate choice. The building went on to win a Civic Trust award, and the Hepworth must certainly have helped. According to Chris Upton’s authoritative account of British shopping malls, the planning committee that granted outline approval in 1964 had been partly won over by the prospect that the Centre would be more than just shops; a ballroom, bowling alley and arts centre or cinema were also promised. In the event, all these community facilities evaporated, but the prestigious Hepworth served “to soften the blow”. 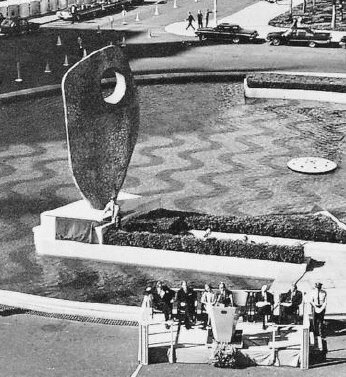 According to Dave Smith’s recollection, Barbara Hepworth, interviewed on local telly at the unveiling, “stressed that in donating[??] the work to the town … she intended to enrich the cultural life of the place and to give Wulfrunians a rare opportunity to … experience a piece of living art.” Put like that, it might come over as a bit condescending, but we know what she meant. The intention was good. 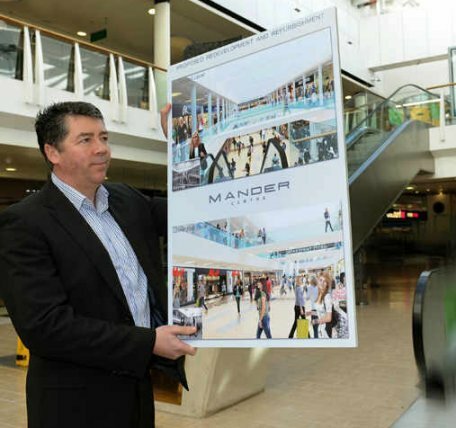 The Mander Brothers paint magnates owned and built half of Wolverhampton, and the Mander Centre was developed on the site of their original works. The Mander family pile at nearby Wightwick Manor is still stuffed with Pre-Raph and Arts & Crafts goodies, and is now operated by the National Trust. The choice of the Hepworth was entirely in keeping with the legacy of public access to good art that has long been associated with the Mander name. Whoever may own it, the Hepworth is an iconic local landmark and part of Wolverhampton’s heritage. 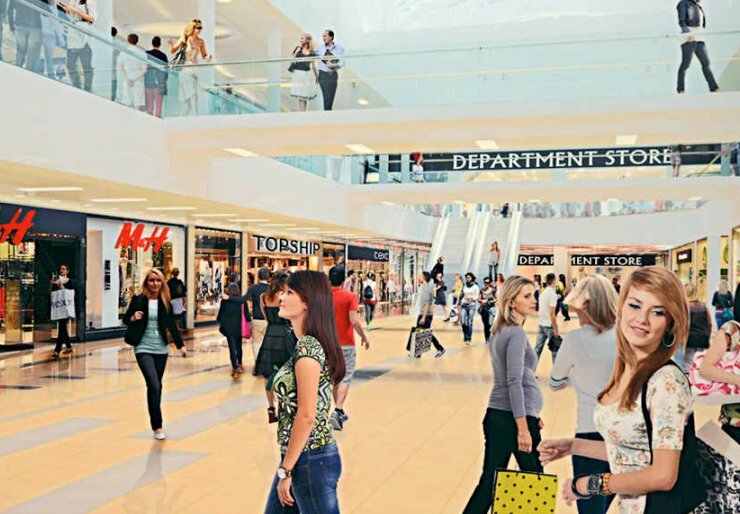 Which makes the Mander Centre’s silence concerning its future particularly frustrating. ‘Time is the most valuable thing anyone can spend.’ Take note please, RBS. Roundabouts. Small but perfect islands, still jewels set in hostile, rushing rivers of metal and tarmac noise. Islands of silence, uninhabited, unvisited. How often, as you have swept off at the second exit, cursing the poor lane management of the driver in front, while catching momentary, parting glimpses of your sidewards fellow voyagers, each, like yourself, tight lipped and frozen darkly behind glass – how often have you not longed to explore, at your leisure, the strange topography of that grassy Eden, planted with two silver birches, a few shrubs like tired mounds of pubic hair, and a small placard sponsored by a local haulier – a topography of which you have been aware, as of an unsatisfactory vision in a dream, only from the corner of your eye? Cease your motion, says the vision. Stop a while. Visit me. Find refuge here. But there are no visitors. These are deserted islands. Cousins, in fact, to the desert islands in that peculiar genre of single column, quick gag cartoons, now probably encountered only in the cartoon museum, that are set on gentle, circular mounds with a single palm tree, against the horizon of a sea that is featureless, save for the occasional circling shark fin. But cartoon islands sustain, miraculously, two or three shipwrecked characters. (Seated woman glowering at edge of island, her back to standing man who leans casually against the palm tree as he addresses second woman: “My wife thinks I’m having an affair.”) So where are the Robinson Crusoes of our roundabouts, the astronauts who will land upon these inverted craters? Where are the actors to create situations in these open air theatres in the round, these amphitheatres of turf? Their absence has been noted. The official mind has considered the emptiness of these spaces and has logged it as a source of social anxiety. And it has offered an improving solution: roundabout sculpture. As a genre, this has been properly neglected by the critics. It is produced, like much civic outdoor art, by artists you have never heard of, usually references some local industrial heritage in which the community is to be encouraged to take pride now that it is long and entirely gone, and is often financed by a distant European Union fund. As art pops up across the panoramas of the planning departments, our roundabouts now sprout industrial abstractions, spangled Pegasi, or rusting piles of steel that resemble abandoned rockets. Most of this is regrettable. None of it begins to compensate for the human absence. For three decades until his death from pneumonia in 2007 at the age of 86, Josef Stawinoga, generally known as “Fred the Ring Road Tramp”, lived under canvas on a stretch of the grassy central reservation of the Wolverhampton ring road, where he busied himself each day sweeping up the leaves into neat piles under the overlooking trees. There are some interesting aspects to his story, not least his veneration as a holy man by the local Hindu and Sikh communities, and the urban legends that attached to him – had he been a guard in Hitler’s SS? Did he really have a huge stash of untouched pension money? And so on. But the essential point here is that Fred had colonised, if not a roundabout, at least a sizeable piece of virgin urban no man’s land, untrodden by any human boot since that of the engineers and landscapers who laid it out, and had claimed it as his habitation. But these are only the pioneers, the first to hear the call of the last wild places on earth. Our roundabouts demand their explorers, their settlers, their dramatis personae. Had I the time, energy and sponsorship (which I have not), I would take steps immediately to organise a well equipped and substantial expedition, that would traverse England by foot from Newquay to Norfolk, planting its tents on each roundabout within its route. Photos would evidence these small triumphs, an enormously popular blog would record the team’s progress, and documentary rights would be sold to Channel Four. So be brave, my imaginary crew, and take back the roundabouts of Albion! Carve your pathway through the mosaic of KFC wrappers and cracked plastic wheel trim, the flotsam and jetsam of a tired civilisation that decorate the outer shores of the chosen ground that will host your tents. Ascend the gentle but significant dome of turf that marks this as a real place, a locus that requires your genius – your mound, your castle, your keep, your finders keepers. Brush apart the corporate daffodils and plant firmly at their centre the flag of your new republic. The world will applaud.